We’d love your help. Let us know what’s wrong with this preview of Best in Show by Maria Grazia Swan. Mina Calvi, Italian transplant to Southern California, thinks her love life might finally come together, just as her professional life has. Her Furry Friends Foundation, a no-kill shelter for rescued cats and dogs, is a success, and Mina hopes she may find a loving forever home for her-self, in the arms of Diego Moran, her elusive, frustratingly mysterious, on again-off ag Mina Calvi, Italian transplant to Southern California, thinks her love life might finally come together, just as her professional life has. Her Furry Friends Foundation, a no-kill shelter for rescued cats and dogs, is a success, and Mina hopes she may find a loving forever home for her-self, in the arms of Diego Moran, her elusive, frustratingly mysterious, on again-off again, lover. 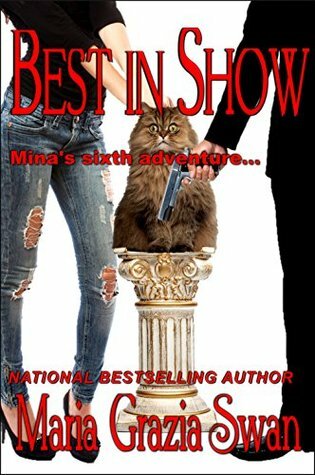 Meanwhile, a Best in Show cat takes up residence at the Ritzy Cats B&B, Mina’s other venture, setting Mina on the trail of a suspicious character who might not have the cat's best interests at heart. This is not your ordinary mystery, but that is part of the reason I enjoy this series. Mina is one crazy woman and she is always on some new adventure. Then of course there is Diego and cats! This is not a story you can easily describe, it needs to be read to be enjoyed to its' fullest. You think that Mina and Diego may just have some time alone to enjoy each other when something comes up to put the stops to it. This is a terrific series and you will enjoy every one of Mina's adventures! Mina continues to mature although by now you would think she would get over her spouts of jealousy and made up indiscretions whenever Diego is out of touch. But her business is doing well. And for the first time, in this mystery, I felt she had come into her own as a potential mystery solver. Before it has always seemed like troubles pertaining to Diego pulled her in to the suspense. But Mina herself was the star of this book. I loved book number 5 and this sequel is better! The story about the relationship between Mona and Diego is great by itself but add into it the background story of Mina's cat business & it takes it to another level. I need to both go back to book one and continue with this series. I highly recommend this book!!! I really enjoyed "A Cat to Die For" the 5th in this series by Maria Grazia Swan. And I will be reading the first 4 in this series!! I quickly said YES when asked to read this one. Mina is a character that most of us can relate to. Her always seems to be missing boyfriend drives her to distraction--as does her partner in her Furry Friends Foundation, a no-kill shelter for rescued cats and dogs. She seems to always get involved in trouble with a capital T and this time ended up in the hospital!! Me I really enjoyed "A Cat to Die For" the 5th in this series by Maria Grazia Swan. And I will be reading the first 4 in this series!! I quickly said YES when asked to read this one. Mina is a character that most of us can relate to. Her always seems to be missing boyfriend drives her to distraction--as does her partner in her Furry Friends Foundation, a no-kill shelter for rescued cats and dogs. She seems to always get involved in trouble with a capital T and this time ended up in the hospital!! Meanwhile a Best in Show cat was left to board at the shelter--but there seems to be a problem. Will everything get resolved? And who is that strange man that dropped off the kitty anyway? I really think you will enjoy this clean but mad cap cozy. If you haven't read any of this author's books I suggest you start. I was glad that I read Book 5 before Book 6--there is a continuation here of sorts-although you could read it as a stand alone. Mina's back and just as feisty as ever! I loved this book, another great addition to Mina's Adventures as always Maria Grazia Swan's books are wonderful and a can't miss. love it when i open my kindle and there is the wonderful surprise of a new Swan book. At one point this book had me laughing so hard i could not catch my breath a sure sign that a book is a winner in my little world. so if you have not read this book or any of Ms. Swan's books i would highly Recommend you do so know. I received an ARC eBook in exchange for an honest review. Again, another fun mystery adventure with Mina, Diego, De Fiore, Margo, Millie, Gino and of course Houdini! This series is so good and it's like returning to visit close friends where the fun never stops! Two mysteries converge in this 6th adventure as Mina and Diego's relationship sizzles!! I enjoyed every second of this book and highly recommend it!! As a young girl, her vivid imagination predestined her to be a writer. She won Maria Grazia Swan was born in Italy, but this rolling stone has definitely gathered no moss. She lived in Belgium, France, Germany, in beautiful Orange County, California where she raised her family, and is currently at home in Phoenix, Arizona—but stay tuned for weekly updates of Where in the World is Maria Grazia Swan? Maria loves travel, opera, good books, hiking, and intelligent movies (if she can find one, that is). When asked about her idea of a perfect evening, she favors stimulating conversation, spicy Italian food and perfectly chilled Prosecco—but then, who doesn’t? Maria has written short stories for anthologies, articles for high profile magazines and numerous blogs tackling love and life. She engaged her editorial and non-fiction skills for Mating Dance Rituals for Singles Who Weren't born yesterday. Her romantic suspense novels Love Thy Sister,Bosom Bodies and Italian Summer are available at Amazon.com.